And I definitely ‘like’ totally target on facebook. I love totally target on Facebook okay I know– I really really like Totally Target on Facebook! My kids would no nuts over the magnifying glass! They love bugs. Thanks for the giveaways! 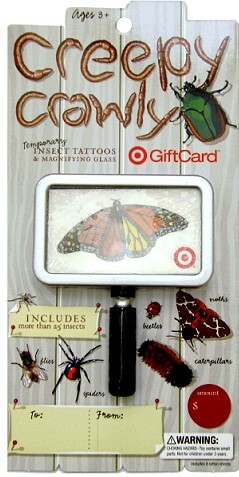 My girls love bugs do they will like the tattoos and I will love the giftcard. I love getting TG deals on FB….THX TT! I sure could use a $50 Target gift card right ’bout now! I already liked totally target on fb! I like (and have for awhile) you on FB! Thanks for the opportunity to try and win all these great giveaways! I have “liked” TT for over a year and will continue to do so. Thanks for another gifcard giveaway. Awesome gift card, always wanted a magnifying glass. already like and follow totally target on fb! This card would be so much fun to win and I’d even get a magnifier for that pesky small print. I guess u could buy buy spray HAHAHA i crack myself up! Always love to score a free gift card especially to Target! I follow u on fb 🙂 and love every minute of it. I would love to win this gift card! Thanks!